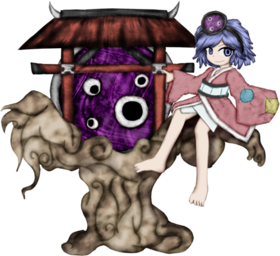 Mitsumo (照雲) is a mirror youkai and the stage 1 boss of the brilliant route of Brilliant Pagoda or Haze Castle. The little child accompanying it is a victim named Terumi (輝美), who was absorbed and serves as its current vessel. Despite their appearance, they eat humans by absorbing them into their mirror, although they aren't very good at sensing humans. The mirror is the real Mitsumo; the human accompanying the mirror has been possessed by them and serves a vessel. It's unclear when the mirror became a tsukumogami, but it needed to absorb humans in order to communicate and move around, which it does by projecting their biggest fear and possessing them afterwards. Its current victim is a young child named Terumi. However, it's implied that Mitsumo's vessels don't last long. Despite being a weak youkai, Mitsumo is powerful enough to make humans their vessels. However, their vessels don't last for long, so Mitsumo is always looking for new vessels to consume. In speech, they speak with an archaic Japanese language, implying that they've been alive for a long time. Mitsumo is able to project the biggest fears of their opponents in the mirror that forms their true body. They use this ability to brainwash people and use them as vessels, since their main body is immobile. Their full name is Mitsumo (照雲), meaning "Illumination Cloud". "照" (illumination) appears to be taken from "照妖鏡" (shouyoukyou, lit. "evil-illuminating mirror"), while 雲 (cloud) appears to be taken from "雲外鏡" (ungaikyou, lit. "mirror beyond clouds"), both being names for mirror tsukumogami. Mitsumo's main body is based heavily on Toriyama Sekien's illustration of an Ungaikyou, as seen here. It is a floating brown torii with a big rounded mirror sitting on what appears to be a tree. The torii has horns and the mirror is eerily purple with floating eyes within it. Terumi, the human accompanying Mitsumo, has short purple hair and empty purple eyes. They wear a short pink kimono and are barefooted. They wear a small mirror resembling Mitsumo as a hair accessory. Mitsumo is the first stage boss of the brilliant route of Brilliant Pagoda or Haze Castle. In the demo version, you'll find it and Terumi as the first stage boss on the haze route. It is wandering aimlessly around the Shrine Road, hoping to find a new human vessel. While wandering around the Shrine Road, Mitsumo encounters Yabusame Houlen and company. Shion realizes that the mirror youkai is evil and thus it has a disgusting soul. Tsubakura Enraku believes that the mirror is possessed, but Mitsumo corrects them and says that they are actually possessing the child who accompanies it. Angry, Tsubakura decides to attack both youkai and possessed human in order to separate them. After Mitsumo is defeated, Shion concludes that the mirror doesn't look tasty at all, but tries it anyway, much to the youkai's horror. Mitsumo ambushes Taira no Fumikado and their lackeys, hoping to find a new vessel. They are disappointed when they find that they're all non-human. They realize that the mirror is a dangerous youkai that consumes humans. Mitsumo is interested in Fumikado and tries to possess them in order to become a new vessel, but the homunculus fights and becomes victorious. The Shitodo siblings encounter Mitsumo. Kuroji believes that if they capture Mitsumo, they'll receive a bounty so they attack the mirror. After Mitsumo is defeated, Kuroji is dissapointed that the battle was too short and loses interest in trying to capture them. But does so anyway, in order to sell Mitsumo to traffic slave. While Sukune Katano and Sese Kitsugai are tagging along with Tenkai Zuifeng, they spot Mitsumo. Sese and Sukune realize Mitsumo it's an evil youkai and beat them up. Mitsumo is the first youkai to attack and consume humans in the Len'en Project. Mitsumo is the first youkai in the Len'en Project to not take a humanoid form. This page was last edited on 13 November 2018, at 09:55.